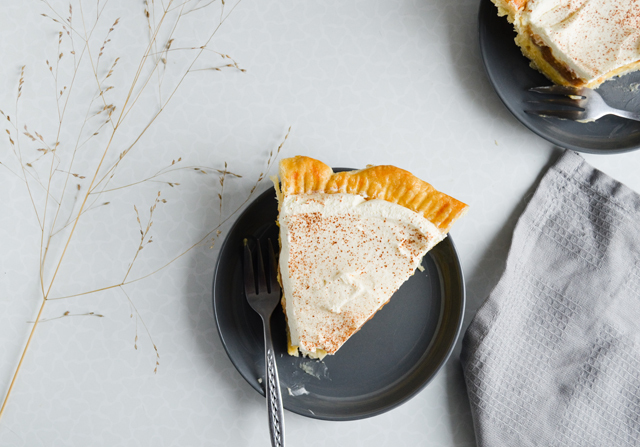 Why have only apple pie when you can have Vanilla pudding apple cream pie? 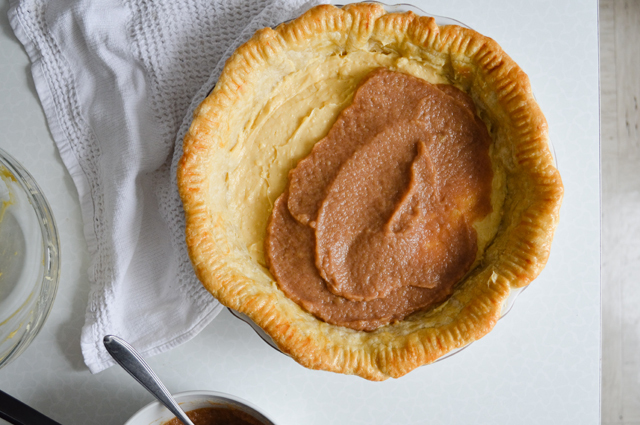 It could be that you already know what kind of pie or pies you’re baking this week. Or if you’re super lucky, you’ll be the one on the receiving end and just enjoy a piece, or three (hey, I’ll never judge you). 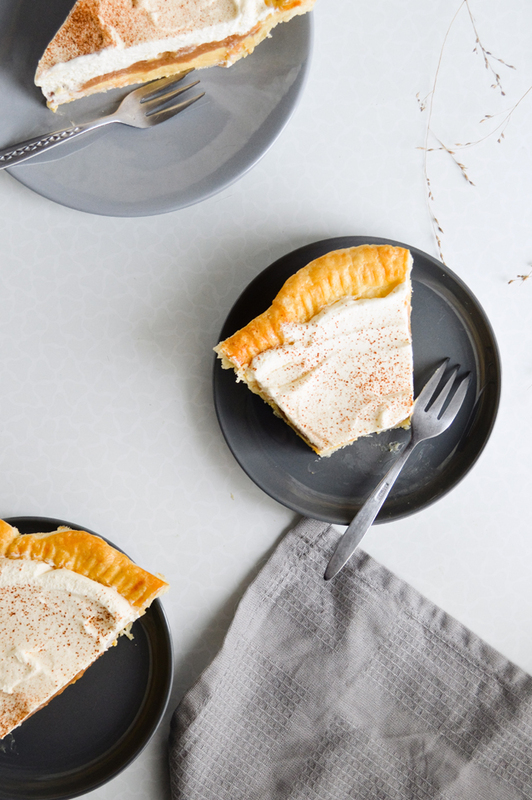 But if you’re still playing around with ideas or if you’re not sure whether you even want pie I’m here to convince you to have a go at this vanilla pudding apple cream pie. It was the star of the weekend for me. It snowed on Saturday and I got so excited! I thought we were getting the first real snowfall of the season. But it only snowed for a few hours and then the next day there were no signs of it left. Whyyyy? It’s not that I don’t like the dry Fall weather, because I love it, but having a snowy intro to December would be really nice. But snow or no snow, it was so cold I had no desire to go out at all. So pie baking was what I did. 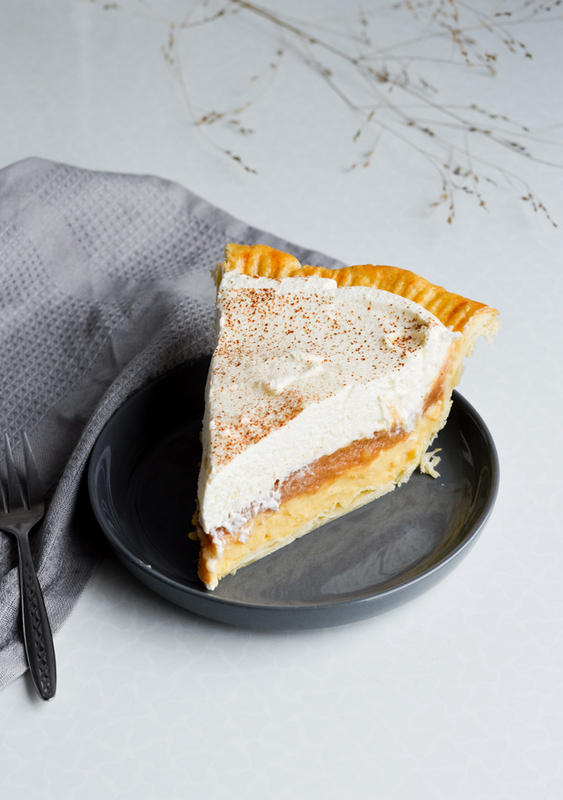 And let’s talk about this Vanilla pudding apple cream pie, because it’s more interesting than weather, I admit. It is a mix of two of my favorite things – vanilla pudding and applesauce. Or a mix between banana cream pie, without the bananas, and a classic apple pie. They really make a great pair. Vanilla pudding is sweet, but mild and the slightly acidic applesauce, loaded with cinnamon, complements it nicely. Add flaky crust and whipped cream to that and sing “this is what dreams are made of”, because they are. 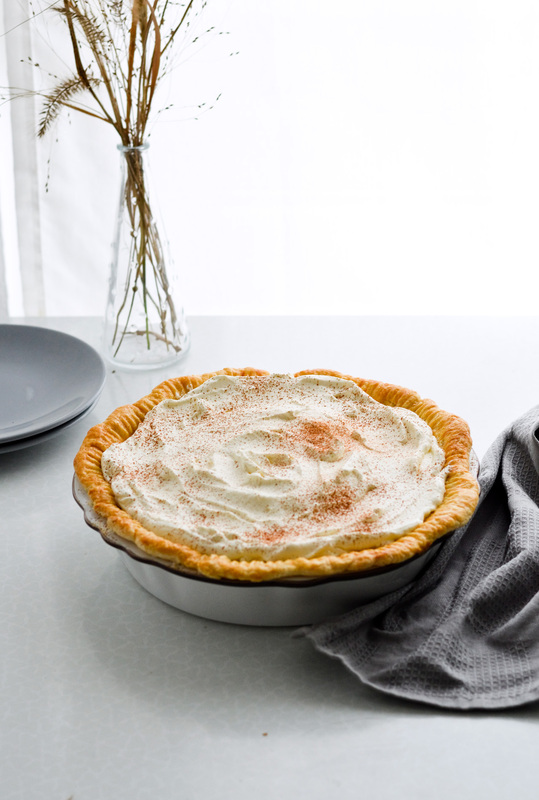 I like to sprinkle some cinnamon over whipped cream too, to make the pie smell extra good and look very pretty. 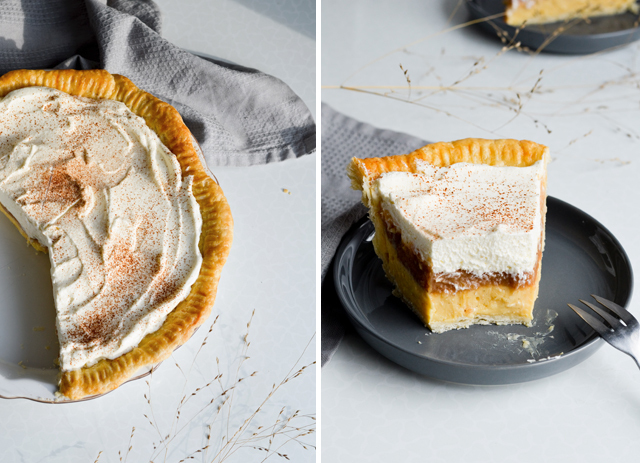 A dreamy pie that combines flaky crust with layers of vanilla pudding, applesauce filling and whipped cream. Recipe makes one 9-inch (23-cm) pie, easily cut into 8 pieces. Add 4 tablespoons of water and mix it in. This will lightly moisten the mixture. Keep adding it tablespoon by tablespoon, quickly pulsing or mixing between each addition, just until the dough comes together (when you can pinch it and it holds together). Flour your counter and transfer the dough onto it. Bring it together with your hands, knead just until it forms a shape, form it into a disk and wrap in plastic wrap. Transfer it to the fridge and chill for at least an hour, ideally overnight. Preheat oven to 204°C (400°F) and lightly butter a 9-inch pie dish. Set aside. Remove the dough from the fridge and leave it on the counter for 10 minutes (can be less if your kitchen is very hot), so it comes to room temperature. Generously flour your work surface and rolling pin. Roll the dough from the middle outwards in all directions, forming a large 13-inch (33-cm) circle. Keep rotating the dough as you roll it, so it doesn’t stick to your work surface. Wrap the dough around your rolling pin and transfer it to the prepared baking dish. Gently fit it into the bottom and up the sides of your pie dish. Trim the dough around the dish, leaving about a 1.5 inch (almost 4 cm) overhang. Tuck the overhand under itself all around, then decoratively make indentations in it with a fork. 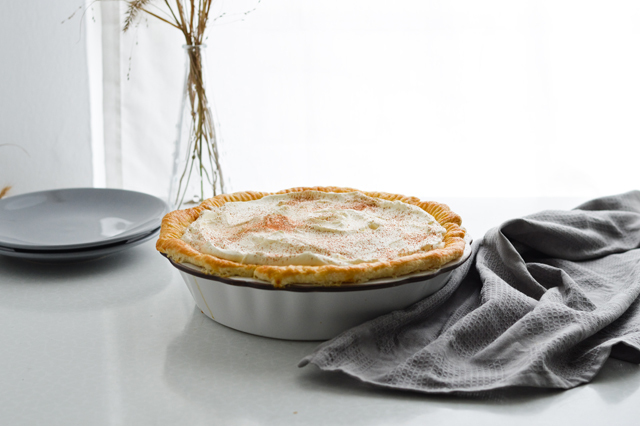 Brush the edge with egg wash. Lightly brush a piece of parchment paper with oil and nestle it into the pie crust. Pour over dried (or baking) beans or pie weights. Transfer to the oven, bake for 20 minutes, until the edges are slightly golden brown. Remove from oven, lower the temperature to 150°C (300°F), carefully remove the parchment and beans from the pie. Bake for another 20 minutes, until the shell is golden brown. Set aside to cool completely. In a medium heatproof bowl, mix the egg yolks with sugar. In another bowl, combine the flour and cornstarch then add to the egg mixture. Mix until you get a smooth paste, set aside. In a saucepan bring milk just to boiling (right when milk begins to foam up). Remove from heat and slowly add to the egg mixture, whisking constantly to prevent curdling. Pour this mixture into a clean medium saucepan and cook over medium heat until boiling, whisking constantly. When it begins to boil, whisk for another 30-60 seconds just until it becomes thick. 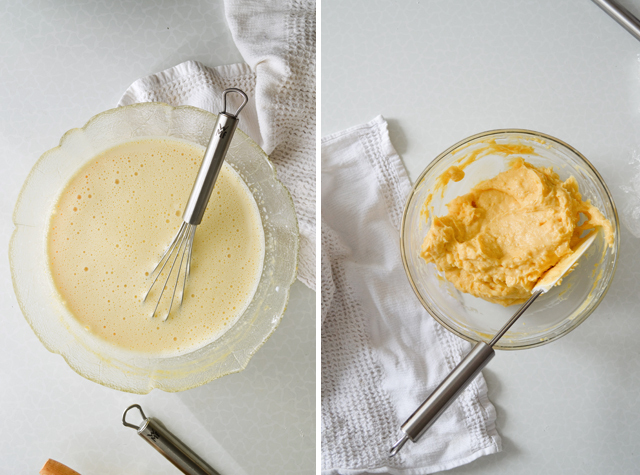 Remove form heat and whisk in the vanilla paste and rum (if using). Pour into a clean glass bowl and cover the surface with plastic wrap (put it directly on the pudding, to prevent a crust from forming). Cool to room temperature before using (or store in the fridge overnight). In a medium saucepan combine the chopped apples with 1/2 of the water (120ml or 1/2 cup). Sprinkle with 2 tablespoons of sugar and cover the pot with lid. Cook on medium-high heat and bring to a boil. Add cinnamon and keep cooking (stirring occasionally) for about 15 minutes, until the apples are very soft. – When the water has evaporated add the other half you saved. You only want enough water so the apples don’t stick to the pan. 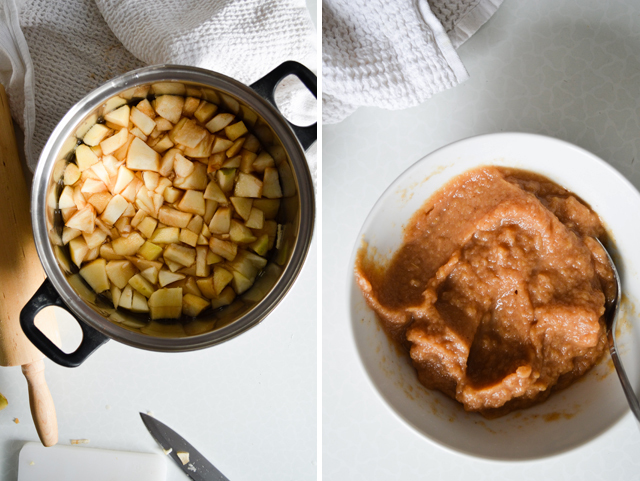 Transfer cooked apples to a food processor (without any remaining liquid). Blend until apples are completely pureed (however the applesauce will still look grainy). Transfer the applesauce back to the pot, taste to see if you want more sugar or cinnamon. In a small bowl, combine the cream and cornstarch. Add to the applesauce and cook over medium-high heat just until it it begins to bubble up. Cook for another 30 seconds, transfer to a bowl and cool to room temperature. 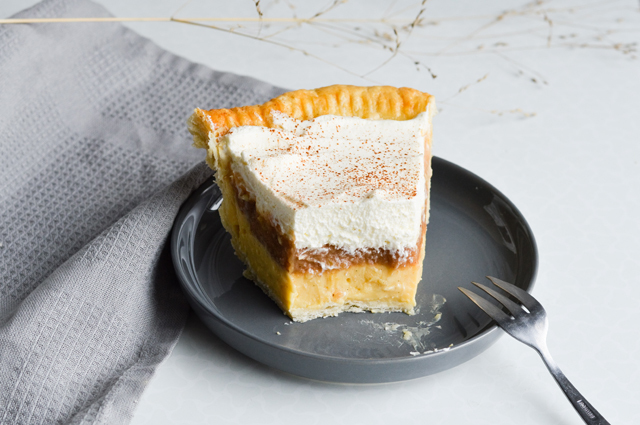 If you’ve been chilling it for a long time, mix the vanilla pudding with a spatula first, to make it easily spreadable, then spread it all over the bottom of the pie crust. Top with the applesauce, as evenly as possible. Cover the pie with plastic wrap and place it in the fridge. In your stand mixer, combine the cream and sugar. Whisk on medium speed until stiff peeks form. 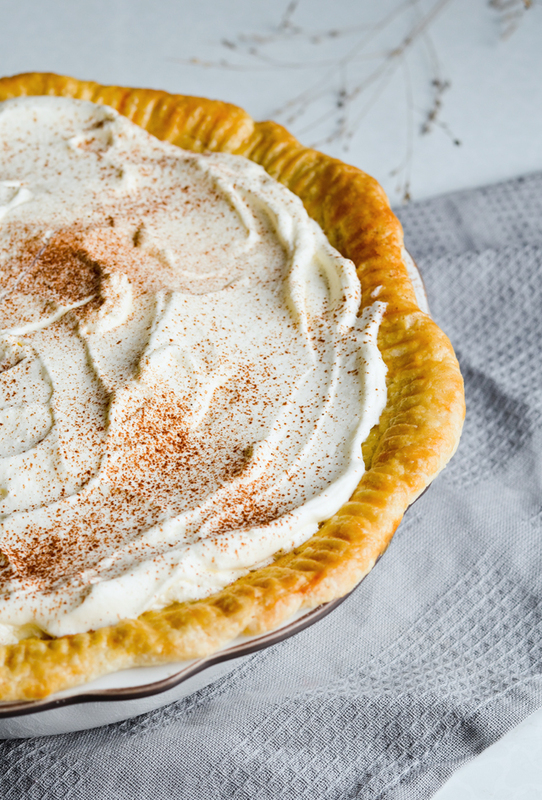 Take the pie out of the refrigerator and spread whipped cream all over. Sprinkle with cinnamon, then chill until serving time. Keep the pie covered and stored in the fridge for up to three days, although it tastes best on the first and second day. If you want more applesauce filling, simply double the ingredients. Making pie dough with frozen grated butter, instead of finely diced butter, is quite a new thing for me. But this has quickly become my favorite way of making pie dough, because the end result is the flakiest pie crust I have ever seen. In case this information comes in handy for planning, it takes about an hour (in my freezer) for the butter to freeze. You can have everything ready a day ahead of serving time. Make the pie dough a day ahead, wrap it in plastic wrap and store in the fridge overnight. Then store the baked crust for another day, wrapped in plastic wrap, at room temperature. Store vanilla pudding and applesauce filling, both tightly covered with plastic wrap, in the fridge overnight. Make whipped cream on the day you plan on serving the pie. Assemble the pie, then chill for 2 hours (or more) prior to serving. This will harden the cream and make pie easier to cut. Thanks so much Annie! Happy to have you here.